The point at which you begin to create synonyms will depend on your adapter, Reporting Server, and possibly your WebFOCUS Client configuration (as described in Data Access Configuration Variations). Whenever you are ready, you can use the Create Synonym tool to create synonyms for the data sources you need to access. A server administrator or an application administrator who has been granted these privileges can configure and manage WebFOCUS Reporting Servers through the Reporting Server Console. You can use the Server Console as an alternative to the Developer Studio tools to configure adapters, add remote servers, and create synonyms. 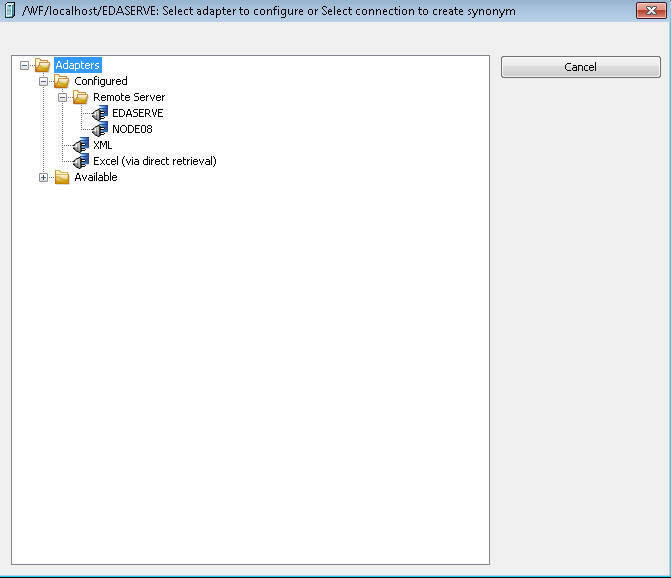 In addition, many other configuration options are available through the Server Console. For a full understanding of configuration options and server capabilities, see the Server Console Help system or the following manuals: Server Administration for UNIX, Windows, OpenVMS, IBM i, and z/OS and Adapter Administration for UNIX, Windows, OpenVMS, IBM i, and z/OS . This console is sometimes referred to as the Web Console or the Reporting Server Console. For Developer Studio installations that allow stand-alone development, the local, default WebFOCUS Reporting Server normally runs with security OFF, and the user who installed Developer Studio is the default administrator.